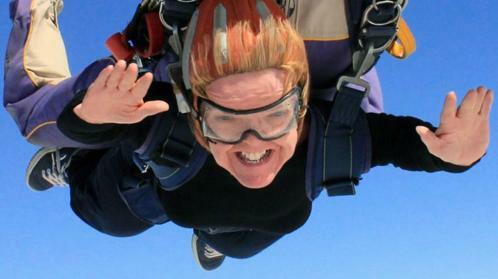 A charity campaigner with dwarfism fell 15,000 feet to her death during one of her first solo skydives having backed out of two jumps hours earlier, an inquest has been told. Pamela Gower had attempted a barrel-roll manoeuvre but started spinning too fast to deploy her custom-made parachute kit, leaving her exposed to a G-force stronger than that experienced by a fighter pilot. She had twice decided not to jump alone that day before going up in the plane with her instructor, Michelle Meakins. “My mind wants to do it but my body doesn’t,” she had said. Ms Gower, 49, an employment adviser at Remploy, which finds work for people with disabilities, died in September. She landed on a parked car at Shotton Colliery near Peterlee Parachute Centre. She was taken to hospital by air ambulance but died of her injuries. She used a custom-made parachute kit as she would be unable to reach the deployment handle on other kits because of her dwarfism. Video footage showed her trying to deploy the parachute several times in the fatal jump. She had opened her own parachute several times in the past and had undergone wind tunnel training in how to deal with a spin, the inquest at County Durham and Darlington coroner’s court heard. Andrew Tweddle, the coroner, recorded a verdict of death by misadventure, saying that in an extraordinary set of circumstances her small stature had made it difficult to recover using the usual arching position. He has written to the British Parachute Association after Ms Gower’s family raised concerns that there had been a three-month gap between her wind tunnel training and the fatal jump. The British Parachute Association questioned whether Ms Gower had gone beyond her capability, but said no rules had been broken “and instructors have to make judgement calls”. After her death, Ms Gower’s parents, Catherine and Len, said their daughter was a “very determined and independent woman who let nothing get in her way”. They thanked the people who had tried to save her.